Thanks to NatWest Uxbridge branch for raising over £200 pounds for HNWL between the 17th and 21st May. Special thanks go to Suraj, the bank’s apprentice, who helped organise a raffle, a sponsored casual Friday dress code and collected donations from both staff and customers. HNWL was represented at the event by Pat, Tony, Bharat and Ermes. Thanks to everyone for their generosity. Well done and many thanks to our own Liz, Tracey and Claire and everyone else who trekked across the South Downs raising funds for HNWL and Cancer Research on Saturday 12th May. Particular thanks to Liz for organising this which has resulted in a most welcome donation to HNWL’s funds. 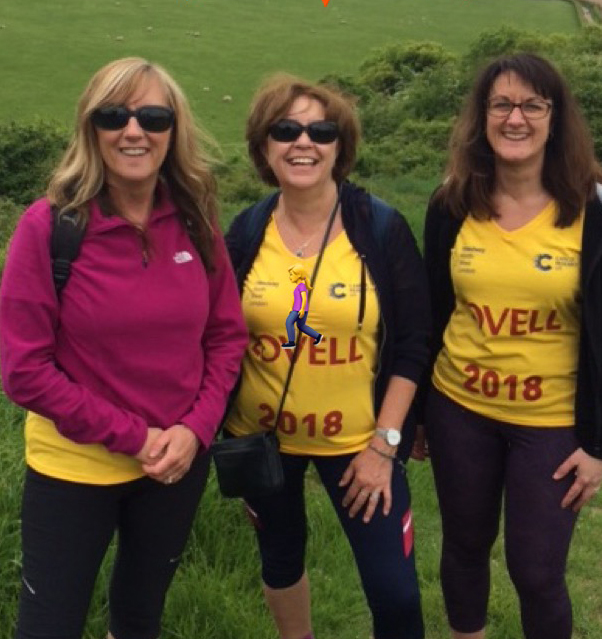 A huge thank you to Tracey Freeman and her mother, Pat from everyone at HNWL for the Race Night Fundraiser held at Stanmore Golf Club on the 17th April. When Pat’s husband and Tracey’s dad, Arthur, passed away it was the family’s wish that a donation be made to HNWL and that this should be spent on a treat for all its members. The Race Night raised £1850 for HNWL as well as being great fun for the 140 racegoers who attended. A big thank you goes out to all the people who volunteered to help make the evening happen, especially Ian who worked tirelessly in the weeks leading up to the event. Thank you to everyone involved for their kindness and generosity. Acidity. Big. Tannins. Fruity. Oaked. Refined. All words used by the sophisticated connoisseurs(?) at the Wine Tasting Evening on the 6th April. Words that helped them identify, or in many cases, not, the mystery wines provided by our host, George. Great fun was had by all and the evening raised about £900 for HNWL. Many thanks to Sue for organising the event and to George for hosting the ‘Call My Bluff’ format. Thanks must also go to Sue and Siobhan for keeping the audience hydrated, wine-wise. Thanks, as ever, to everyone who attended for their generosity. 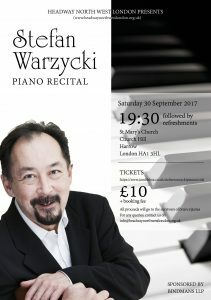 We hope you can join us on 30th September for a piano recital fundraiser. 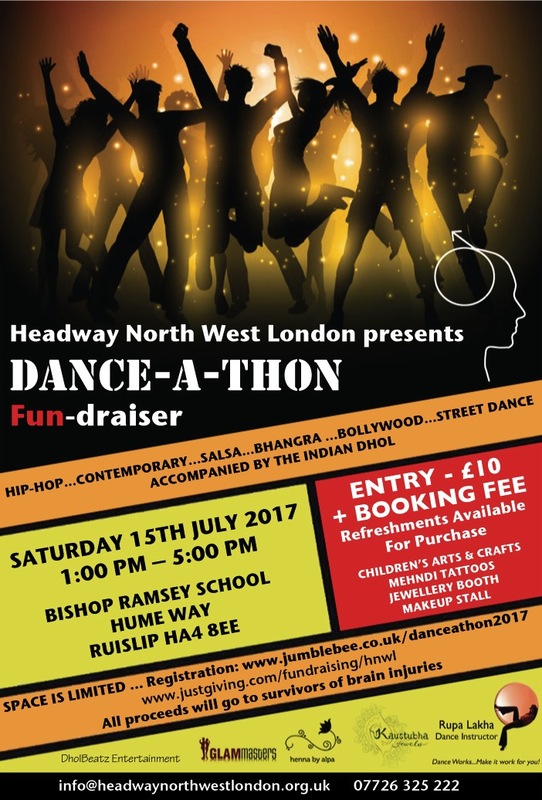 All proceeds go towards supporting Headway North West London, helping us provide better services to support adults living with acquired brain injuries. Tickets cost £10 each and can be purchased online (link below), in person (e.g. : at our AGM tonight) or on the night if you are a last-minute attendee. Stefan Warzycki was born in Tokyo but grew up in the United States. Since graduating from the San Francisco Conservatory of Music, where he made his concerto debut with the San Francisco Symphony Orchestra, he has lived in London, where he also teaches piano. He has given recitals and concerto performances in prestigious London venues such as Wigmore Hall, at the Edinburgh and Brighton Festivals, and on tour in Europe, America, Japan and SE Asia. A few years ago Stefan’s right hand fell victim to focal dystonia, a debilitating neurological condition which severely impairs control of the fingers, but his left hand is unaffected and – like eminent predecessors such as Paul Wittgenstein and Leon Fleisher – he has re-invented himself as a left-handed pianist, applying his same masterly musicianship to the select and technically challenging left-handed repertoire. 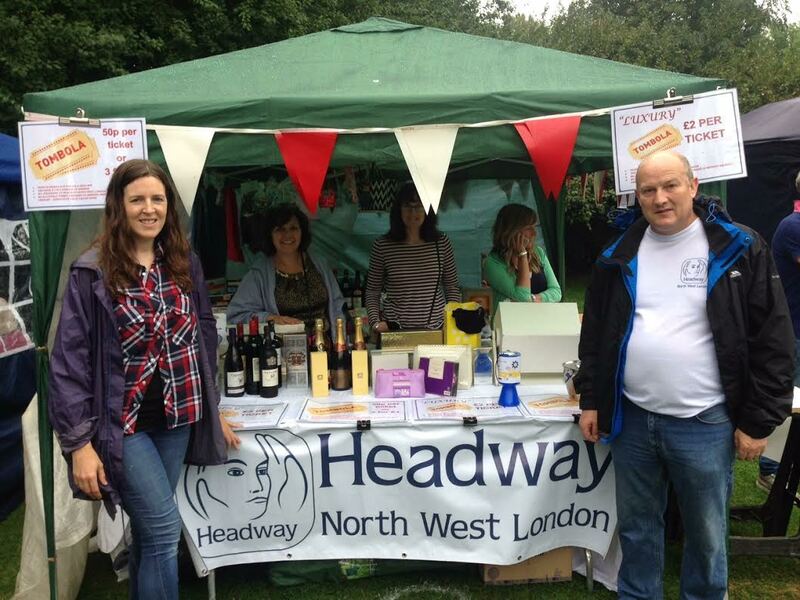 This year the HNWL stall at the Pinner Village Show raised over £500!! A Huge thank you to all those involved on the day! I decided to try and climb Mount Kilimanjaro towards the middle of last year and contacted Headway to get some t-shirts and sponsorship forms and before I knew it, I had paid my deposit, booked my flights and signed myself up. My firm buoyantly rose to the challenge and we had bake sales, dinner dates and lots more cake to raise money. I had reached my target of £800 before I left so was feeling sufficiently pressured when we arrived in Moshi Airport in Tanzania. Our guide was the lovely and strong Wilfred, a man who had also taken part in the Sport Relief Kilimanjaro climb a few years ago and regaled us tales of others who had successfully reached the summit. Wilfred was strong and calm. This was crucial. He patiently overlooked our first error of only bringing a single 1 litre bottle of water each. We naiively assumed there would be water along the way but thankfully Wilfred managed to procure a third 1 litre bottle of water for us so we had errr… 1.5 litres of water each per day. With mistake number 1 under our belts we were shaken but not deterred and set off, “pole pole” slowly slowly, one step at a time. In the first two days we walked from 2865 metres above sea level to 3810, averaging 8km per day. We passed rainforest terrain and reached moorland. Day 3 was beautiful as we were above the clouds and could enjoy the stunning scenery and the view of how far we had come, but we were now at 3965 metres above sea level so the altitude sickness began to rock us with symptoms of nausea and sickness. We still had some way to go with the goal being the magical 5895 metres for the summit. The pace was relentless and we were now walking at least 10km per day across 7-8 hours. There were some hairy moments, Wilfred telling me to trust the grip of my boots and scale the side of the mountain with a sheer drop was certainly one. I wasn’t sure that my knock off Hi-Tec boots were quite as snazzy as Wilfred thought but surprisingly it worked and I felt a bit like Spiderman. The worst was yet to come though. A few hours later we heard the panicked voices and hurried actions of some guides from another group who were lifting an injured person all the way back down the mountain in an emergency. We were told he would be fine so forced ourselves to look forward and continue. Day 4 began with a 10km walk and we arrived at our camp site in Barafu at around dinner time. After some food we were told to get a few hours rest before waking up at 11pm to do the final 5km ascent to the summit. This would take us 7 hours. Armed with our head torches, dioralyte sachets, glucose powder and energy bars we began the gruelling walk in the dark. Passing a couple consoling each other as the girl was crying was a low-point. As was watching my boyfriend being fed glucose powder out of Wilfred’s hands when he began to lose consciousness on the dark and gloomy walk up. It was really touch and go whether or not we would make it but we slowed right down and dug deep. We miraculously reached Stella Point for sunrise and had the final hour to get to Uhuru Peak – the highest point on Mount Kilimanjaro. We had the best surge of energy and adrenaline at Stella Point and the final hour was the best, most energetic we had felt in 24 hours. It was a wonderful feeling and we reached Uhuru Peak and couldn’t be more proud of what we had achieved. The views were phenomenal and everyone around us was so pumped. We got back down in a day and a half. Except for a few missing toenails and some cuts and bruises, we got away unscathed by the great mountain. It’s easy to forget what all of this is for. 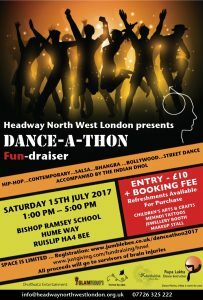 I ended up raising £1,100 for Headway North West London which will go a small way in funding their rehabilitation services, telephone helplines, training days and information packs for family members and carers. Headway are a charity and have over 100 local branches throughout the UK offering their services to people who have suffered from a brain injury. Brain injuries can profoundly change lives and test every aspect of your life – walking, talking, thinking and feeling. The losses can be severe and permanent. • In 2013-2014, there were approximately 956 brain injury hospital admissions to UK hospitals every single day – i.e. one every 90 seconds! • …Sadly women aren’t safe with a 24% increase in female admissions for brain injuries since 2005-2006. The good news is that the majority of people with acquired brain injuries survive but it means there’s an ever increasing demand on support services – which is where Headway comes in. £1,100 is certainly a start but it’s not enough to sustain national charities like Headway. 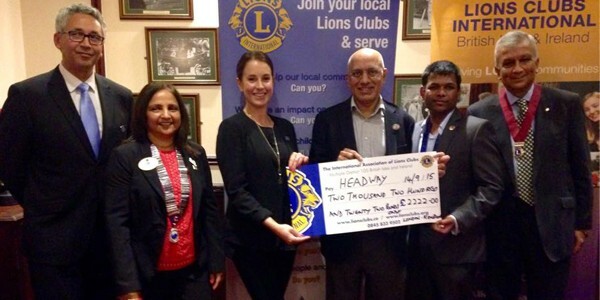 On 14th September 2015 our Service Manager, Aimee Parker, and one of our Trustees, Bushra Hamid, were invited to attend Hendon Lions Club’s general meeting and charity dinner. Aimee presented at the event before receiving a cheque on behalf of HNWL. A huge thank you to the Hendon Lions Club for their generous donation and support.